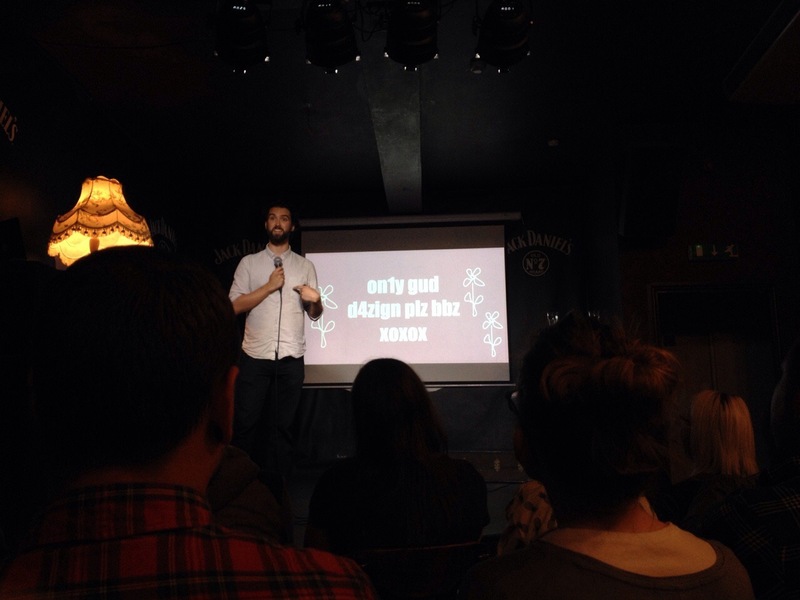 Last night, a few of our Uprisers headed down to 10 Feet Tall for the monthly Design Stuff Cardiff event. For those of you who are unfamiliar with it, Design Stuff Cardiff is a monthly social event about design. Oh, and did we mention it’s free to attend? There’s always a good crowd there and it’s much more relaxed than a seminar or conference. Every month, two designers talk about a topic of their choice which is based around the subject of design. This month saw SEO expert, Steve Morgan, discuss how SEO can factor into and benefit design, and designer Warren Fauvel had a deliciously doom-laden rant about the changing face of the design process, provocatively titled; Designers are Doomed! Steve Morgan: Have your cake, and optimise it too! Steve’s presentation primarily focused on how design and SEO can complement each other rather than conflict with each other, which they’re often wrongly perceived as doing. We’ve previously spoken about how SEO is a science, so understandably it can sometimes be a heavy topic to discuss, particularly when you’re in a bar and the drinks are flowing! Steve did a great job of condensing his presentation, keeping it both interesting and highly relevant to the design orientated audience. Steve’s advice about optimising images was particularly interesting from a design perspective. Many designers don’t realise the small steps they could take to boost a website’s SEO, and these can all be done fairly early in the design process and have great effects. Warren Fauvel: Designers are doomed. Warren Fauvel is the CEO and founder of Nudjed, a health technology platform that aims to promote healthier, happier workforces. Warren’s talk was quite something; an eloquent rant predicting the looming apocalypse of design as we know it. As expected, his presentation was both thought provoking and brilliantly witty, and we very much enjoyed it. Of course, it’s true that with advancing technology, design has become somewhat templated. And with all of the tools now so readily available on the web to automate the process, it’s no surprise that so many people are dabbling with design. With that being said, there’ll always be a need for designers to nurture and guide people through the process and, as Warren rightly said, the designers can adapt their roles to become the teachers and philosophers of this movement. We realise that this design transition has already begun, but it’s important to see it as a new beginning rather than the death of design as we know it. Whilst the skill involved might become less important, a great design concept with a killer idea will always be vital. And there’ll never be a tool that can replicate the creativity of the human brain…at least we hope not! From Steve’s great tactical advice at the start to Warren’s entertainingly informative doom-laden rant, it was a great night with a brilliant balance between the presentations. As an end-to-end digital agency, it was particularly interesting to immerse ourselves into a discussion about how both design and SEO can work in balance. Here at Uprise, we practice what we preach; our SEO specialists and designers work closely together throughout our projects. We think it’s important to have a specialist team with diverse backgrounds and experience. This approach encourages collaboration and ensures that every base is covered. We had a great time at Design Stuff, and can’t wait to head back next month.